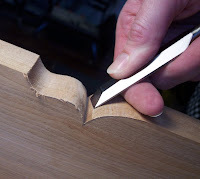 As I continued to remove the bandsaw marks on the sawbuck table legs, I reached for a chisel to clean up the deepest crease in the profile. But not just any chisel. My FIRST chisel. It was purchased 16 years ago at a big box store for a few bucks—ugly, yellow, too-short plastic handle and all. I knew almost nothing about woodworking back then and had no idea what made one chisel better than another. I just knew I could afford this one and hey, it has a cutting edge, doesn’t it? 16 years later, this 3/4” Stanley Workmaster® proudly occupies the #1 slot in my chisel rack. It might not hold an edge as long as my Japanese chisels or be as pretty and as well-balanced as my German chisels, but it’s a real workhorse, sharpens quickly and cuts cleanly. And it reminds me that I don’t have to buy the most expensive tools to get good results. Bottom right is a photo of the first plane, block or otherwise, I ever purchased. I think it cost $10 at the big box store. Knowing nothing about planes at the time, I bought it thinking hey, it has a cutting edge, doesn't it? 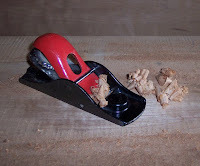 It took me a while to learn how to sharpen it properly, but it does indeed cut. A few years ago, our woodworking club hosted a used tool sale where I offered to the sell this plane for $2. No takers. And lucky for me! I brought it home and, not having used it in years, took a swipe on some wood. Nice clean shaving. The mouth is fixed too wide for a fine, thin shaving, but still, it cuts perfectly. So, how do I employ this plane? It accompanies me every time I visit MLFKAG (My Lumberyard Formerly Known As Garage) which houses stacks of rough cut lumber that I bought at various auctions. Often the wood is so rough or so old, I can’t tell what species it is. A few passes, and the plane quickly exposes the grain beneath the rough surface. I’ll never try to sell you again, little guy.